"Six Generations: Immigration From Europe To America Edition", an innovative card game designed and published by Fyodor Soloview, is a pleasant example of information coupled with entertainment. This game contains a set of 72 cards with pictures of six generations of immigrants belonging to a family who came to the United States from sixteen European nations in the first half of the nineteenth century. The latest generation consists of the siblings Emily and Jacob, currently living in the United States; and the other five generations represent their ancestors. 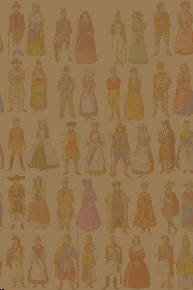 The 72 cards, comprising pictures of 36 men and 36 women, are divided into six categories. Each category portrays a different generation. Players are dealt six cards each, and they are allowed to dispose of a card when the person whose picture is printed on it matches the generation of the card played by the previous players. The ultimate objective of the game is for each player to get rid of all her cards, and the winner is the first one to do so. Recommended for ages six to adult, "Six Generations" is a highly engaging concept aimed at providing wholesome entertainment. It would be a welcome addition to any family's personal collection of games. This game also has educational value, as it provides useful clues to the different types of clothing worn by the people from different nations and time periods that are featured on its cards. Fyodor Soloview's creative idea is well complemented by the appealing artwork of Andrey Ayoshin and Lyudmila Lygina.